This year in 2018, Kim Il-sung’s birthday falls on Sunday, April 15th. His birthday is called the “Tae-yang-jeol” (태양절), which translates as “The Day of the Sun.” He was born in 1912 in Pyongyang at Mangyeongdae, where tourists are forced to visit and bow. This Sunday will be the most important holiday of the year in North Korea. All North Koreans will bow down to the portrait of Kim Il-sung, or face grave consequences. When you go to Beijing, the capital of China, you can see a huge portrait of Mao Zedong in the middle of the city. You see such portraits commonly in communist countries. However, no other country except North Korea has statues of the totalitarian leaders in every city. Besides statues, in every North Korean city, portraits of Kim Il-sung and Kim Jong-il are hung in every single factory, business, military branch, school, and home. The homes in other countries differ dramatically from those in North Korea. 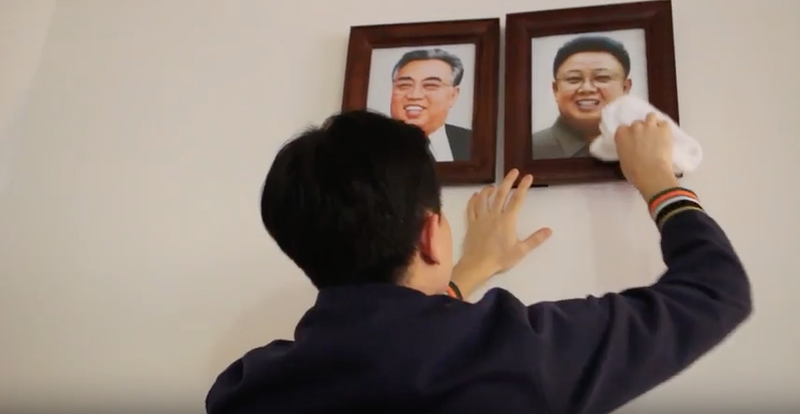 What truly stands out the most is how in every home, without exception, there hang the portraits of Kim Il-Sung, Kim Jong-Il, Kim Jong-Un, and Kim Jung-Suk. Every family in North Korea must display the portraits in their homes; no one can refuse this. It is forbidden to have even just one speck of dust on the portraits because inspectors, who are the head of the in-min-ban (neighborhood watch units), come to inspect the status of the portraits in each and every home two to three times a month. In addition, monthly and quarterly, people called the “geu-roo-ppa” (그루빠) also do a surprise visit and check the status of the portraits. They go to each home randomly, without any prior notice. As a result, North Koreans need to always make sure that these portraits are kept clean. If the portraits are not clean, as in there is any speck of dust found on them, then the families are punished and are chastised in front of everyone in the town or village to be criticized during an event called “sa-sang-tu-jaeng” (사상투쟁). I am still in disbelief that this is common practice in North Korea. It is unacceptable. In kindergarten, little children have to bow to the portraits. For example, the birthdays of Kim Il-Sung and Kim Jong-Il are the most important holidays in North Korea. For these days, North Korean authorities provide candies and snacks for children, from toddlers to kindergarteners. These snacks and candies are usually of poor quality and aren’t even tasty, but nonetheless, the children have to thank the dictator by bowing down to the portraits. The children do so without question because they consider it to be normal and also because the adults tell them to do so. These snacks are provided for North Korean children up until they are in elementary school. When elementary students are given these snacks and candies, they must make sure that their school uniforms are even neater than usual, gather around in the school field, and sing idolizing songs about Kim Il-sung and Kim Jong-il. To view HRNK's first episode of With Love, Your North Korean Neighbor, please click here.